Born in Treviso (1986) is a photographer and video artist who lives and works in Milan. In 2011 he graduated at the University Ca 'Foscari of Venice in Philosophy. He studied Photography at the CFP Bauer in Milan and concluded his studies with an internship at the Studio Armin Linke in Berlin. As a member of the collective care Dirtmor concerts, performances and weekly screenings in Treviso and in 2012 was selected for a one-year residence at the Fondazione Bevilacqua La Masa in Venice. He has participated in numerous festivals and collective exhibitions both in Italy and abroad, including: Communities Italy at the Milan Triennale, Photomonth Riga, Triennale der Photographie Hamburg, Art Space Bronx in New York, Projects for the Arts in Washington , Francesco Fabbri Prize in Treviso, Mediterranean XVII to the Steam Factory of Milan, Exposed Project at Spazio Forma in Milan, This Age to the a + a Gallery in Venice, Salon fur Kunstbuch 21er Haus Vienna, Digital Arts Festival of Athens, in Cynetart Dresden, Zebra Berlin Film Festival. “Our ancient continents have been supplented by immaterial tele-continents constituted by unceasing data flows” Paul Virilio Among the many Google Earth's features there's one in particular that, when activated, allows to visualize, chronologically layered, all the images stored from different satellite remote sensing agencies since 2001. “Human beings distance themselves from nature and arrange it in such a way that it can be mastered”, with these words Theodor Adorno defines the anthropological need to control reality. 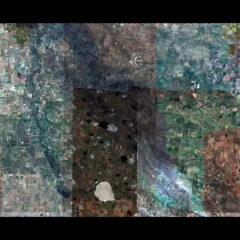 With the information revolution and the advent of the “society of the image”, the excess of representation of the earth's surface leads to a general telematic deterritorialization that overhangs and erases orography and frontiers, both national and natural borders. So, above the biosphere the infosphere unfolds: it's the new digital and virtual landscape crossed by information superhighways in which an ocean of images flows overwhelming every corner of the globe, because, in the words of Gunther Anders, if “in former times there were images in the world, now there is the world-in-image: the world as a wall of images that incessantly catch our gaze, incessantly covers the world”.